Adjustable height: 21"-66" - perfect for floor stand or table top display. Top canvas clamp is spring loaded to securely hold artwork or other load. Cross bar canvas support is fastened with metal adjustment screws for durability and longevity. Easel has telescopic legs to accommodate sitting or standing, and easels are stable. Portability - Folds to only 21" for easy storage,easy portability with a durable carry bag & shoulder strap. Package Dimensions: 22" x 3.9" x 3.4"
Made of high quality lightweight aluminum metal, Adjustable Legs allow for indoor, outdoor and tabletop use. Portable, Lightweight, Adjustable, Sturdy,Silver aluminum metal easel. Tripod design with adjustable telescoping legs stands as tall as 66 inches and reduces to tabletop size as small as 21 inches. Weight with carrying bag is 1.8 pounds. Great for office business meetings or in the boardroom for presentation materials, as a chart holder or white board. Will hold a large pad of paper. Excellent easel stand for a teacher in the classroom. 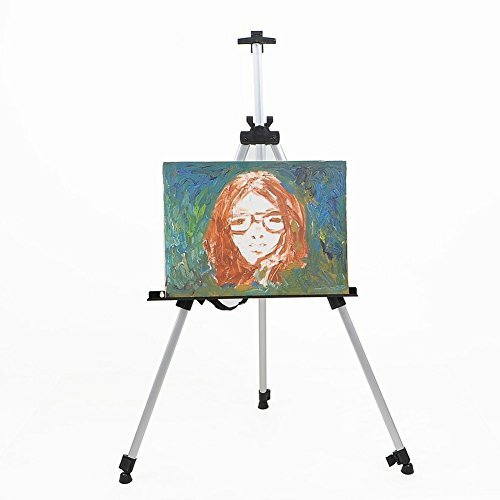 Artists can use it in the studio, as a tabletop painting easel, outdoor in the field, or to display art, canvas paintings, picture frame, posters. Spring Loaded Top Clamp secures canvases in place,adjustable legs for field use, to accommodate uneven ground, great for beginning or advanced artists who paint on location & outdoors. If you have any questions about this product by Bemaxy, contact us by completing and submitting the form below. If you are looking for a specif part number, please include it with your message.